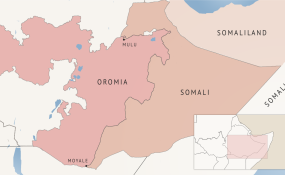 A map of Ethiopia's Oromia and Somali regions. The number of people killed after attack by the Liyu police in at least three separate localities in Eastern Hararghe zone of the Oromia regional state has climbed to 37, according to Tizita Abay, communication officer of the Mayu Muluke Wereda where more than 30 of the causalities were from. More than 44 have been wounded. Abdulahi Ahmedi Kawo, another official from Mayu Muluke Wereda also told the BBC News Afaan Oromo service that ten of the wounded were currently receiving treatment at Gara Muleta hospital, in Gara Muleta town while some 36 are being treated at a local clinic. The attacks happened on Sunday from 10 AM to late afternoon and Sunday to Monday night, in what Mohammed Aliyi, a police officer in the Mayu Muluke town said were a military assault by members of Ethiopia's controversial Liyu Police "for reasons we are not clear with yet," he told Addis Standard by phone. However, Taye Dendea, the region's justice bureau communication head wrote on facebook page yesterday that 31 people were killed, of whom five were women. Children and the elderly were among the victims. Negeri Lencho, Oromia region communication bureau head, confirmed to OBN this afternoon the number of victims and said the attack was in line with the larger pattern of the Liyu Police's track record in attacking civilians. But the government was working to bring a lasting solution, he said. Ibsa Abdella, a nurse who is currently coordinating the emergency section for the wounded, told Addis Standard that eight of the victims were admitted yesterday and two were admitted on various times since Friday afternoon. According to Ibsa, sixteen people were also treated for light injuries. "All of them have sustained bullet wounds; of the ten currently being treated at the hospital two are in critical condition: one who is shot is his genitalia area and a second who was shot in his chest area," Ibsa said by phone from Gara Muleta hospital. "The second who was hit in his chest is Sergent Mustefa Jamal, a member of the Oromia region riot police." Three more of the wounded are also police officers, he said.